Above are the images of each share from last year’s 2017 season! Happy New Years Friends & Farm-ily! 2018 CSA Sign Ups begin TODAY for our Spring, Summer & Fall Season! We hope the winter is treating everyone well! Your farmers are feeling extra inspired and excited for Spring and another year of farming ahead! Thank you for all of your support this last year– we couldn’t be more excited for what is in store for 2018. By being a CSA member and investing in our farm it continues to thrive and get better and better with every passing year. As we head into our 9th season the learning curve is becoming less steep, and we are feeling more confident no matter what ol’ mother nature throws at us. 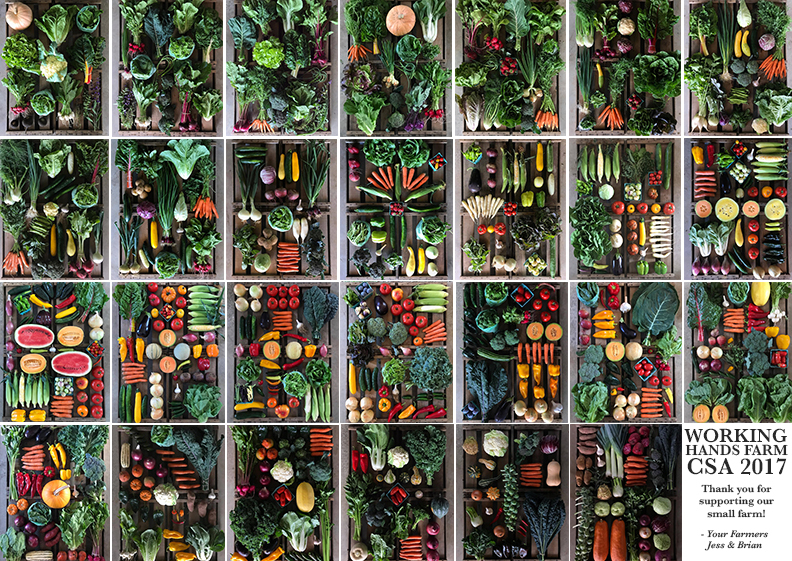 In 2017, over the course of our 28-week Spring, Summer & Fall CSA season Brian & I harvested and distributed 98,000lbs of freshly picked, organic, thoughtfully grown produce to our CSA members. From Spring to Fall, the shares averaged 28lbs (with lighter shares in the Spring and heavier shares in the late summer and Fall) and included 12-20 items with a great variety of crops and delicious tasting veggies that have inspired many fantastic home cooked meals. That’s 816lbs of produce per weekly share which means our members paid $1.48/lb for all their fresh, local, organic produce during the 2017 CSA season. Spring, Summer & Fall CSA Sign-Ups begin TODAY! Shortcut to the CSA Sign Up Form! Pay by Check: Make checks out to ‘Working Hands Farm’ and send it to 7705 SW River Rd. Hillsboro, OR 97123. Checks only! Please make sure to put the shareholders name & type of share in the memo. 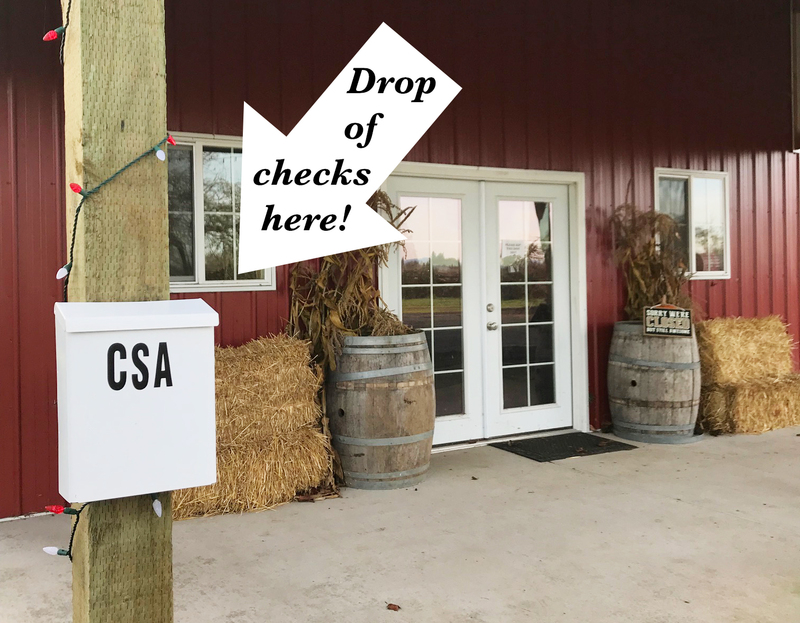 Pay by Check via drop off on the farm: If you would like to drop off your payment in form of a check on the farm, there is clearly marked white CSA lockbox located on a post at the red barn (on your left when you pull in). Please drop it off during regular business hours (9-6pm). Click here to see where to drop off your check! We check it daily. Checks only! Please make sure to put the shareholders name & type of share in the memo. Pay Online: Visit the WHF Farmstore to pay for your share online. Please note that the online payment option includes the 3% + .30 online processing fee. If you wish to avoid this online fee you can pay by check. *In order to reserve your share we require a $250 deposit that is non-refundable and is applied to the total cost of the CSA. The deposit is due within two weeks of submitting our online CSA form. Once your deposit of $250 is received we will send you a confirmation email welcoming you to our CSA program. We encourage those members who can, to pay more than the deposit upon signing up as this helps your farmers absorb the initial expenses that happen at the beginning of the season. Remember that our CSA operates on a first come, first serve basis so sign up ASAP! Thank you all for your support! Word of mouth is the best way to help us grow and sustain our small farm. Please encourage interested friends, family, neighbors & community etc… in signing up for their WHF CSA share. Many thanks for your help from all of us at Working Hands. p.s. Check out this link to our favorite photos from our 2017 season: it’s amazing how much can happen in a year and there’s so much to be thankful for! Enjoy this compilation of our best shots of the year. Happy New Year Jesse and Brian, wish you were a little closer to Cape Cod.